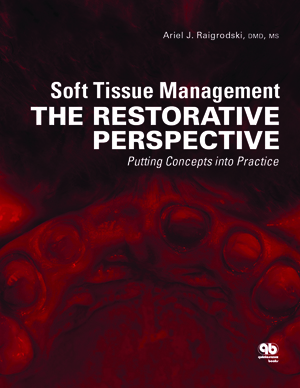 Soft Tissue Management: The Restorative Perspective is a highly visual publication with heavy emphasis on textual description of clinical procedures and the scientific rationale behind them. There are numerous clinical examples of skillfully managed and inspiring treatment results emphasizing the important role of soft tissue management. The book is an excellent reader educator well supported by clinical explanations and concise list of quality references. The clinical images are beautifully photographed, however, in implant cases, mainly “middle to final stage" clinical situations were covered. Therefore, much of the “beginning stages" implemented by the surgical and prosthetic team, which are extremely crucial for achieving the desired outcomes are lacking. There is also paucity of documentation on the management of cases where implants or teeth were not ideally located, or where soft or bone augmentation procedures were not ideally implemented or responsive. Great attention to detail was given to documenting the importance of prosthetic procedures and parts in establishing the desired soft tissue contours. 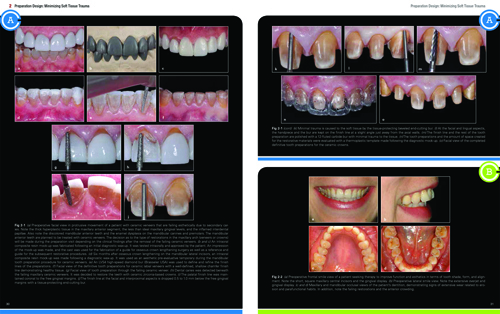 The book is well balanced and covers a variety of factors influencing esthetic tooth and implant restorations. However, multiple implant cases in the esthetic zone are lacking. The clinical results are extremely inspiring and motivational. This book is a significant contribution to a variety of clinical situations where esthetic results depend much on the understanding of tissue responsiveness to prosthetic procedures and parts. The author should be complimented for this publication and his outstanding clinical work.